....and now on to Dessert! As you know, I am admittedly not a successful baker (evidence: my Streussel Sour Cream Coffee Cake post). But I will attempt to make desserts that require "simple" assembly, like those Ikea cabinets in the kids' rooms. By default, I am the official assembler of Ikea furniture at home, since the Husband loses interest (actually patience) when attaching Leg A to Base B with Screw 256 after Step 3. Years ago we moved to a new house in England and I decided to assemble the boys' bunk beds by myself. As I was hauling the finished product up, my neighbor's husband walked into the kids' bedroom and was so impressed that he brought in two cold brewskis. Men! Here's a "simple" dessert adapted from bon appetit's comfort food issue. Whisk first 5 ingredients in a bowl to blend. Add butter and rub in with fingertips until small moist clumps form. Cover and chill. Preheat the oven to 375 deg F. Stir sugar and butter in large skillet over medium heat until smooth sauce forms. Add lemon juice and cook, stirring, until caramel is deep brown, about 5 minutes. (It is very important not to burn the caramel, or else it will turn bitter). Mix in salt, then apples. Toss until apples are evenly coated. Scrape apples and caramel into 13x9x2-inch glass baking dish; spread evenly. Sprinkle topping evenly over. 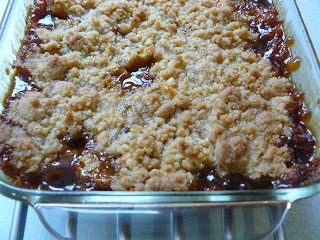 Bake crisp until apples are tender, sauce is bubbling thickly, and topping is golden, about 50 minutes. 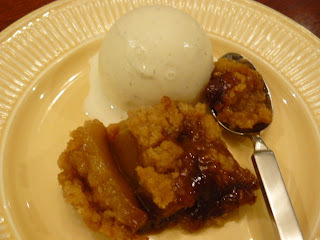 Let crisp cool 15 minutes before serving with a scoop of vanilla ice cream. This looks very good! I will ask your sister to make it for us, but it is basically apple pie. 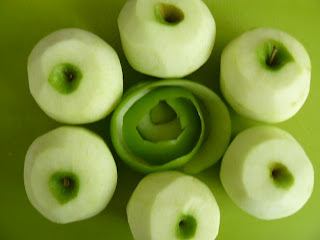 Anonymous, I hope you enjoy this twist to good old apple pie!